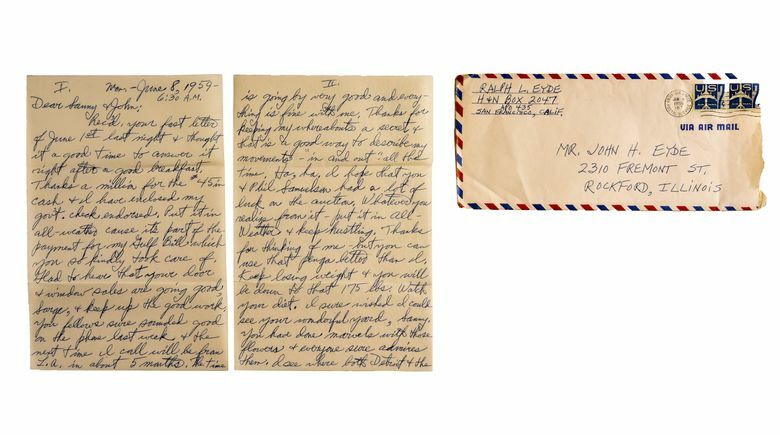 Four siblings wrote hundreds of letters to one another during World War II. The story they tell of service, sacrifice and trauma was hidden away in an abandoned storage unit — until now. MESA, Ariz. — The storage unit’s corrugated metal door slid upward, revealing 100 square feet of mostly empty space. Not very promising, thought Joe Alosi, a businessman who bids on units, sight unseen, when tenants stop paying the rent. Several plastic bins sat in the middle of the floor, and dust billowed as Alosi peeled off the first lid. Inside, tightly packed, were rows of envelopes. Alosi opened one, and then another, and then another. The Marine Corps veteran felt a slight chill. 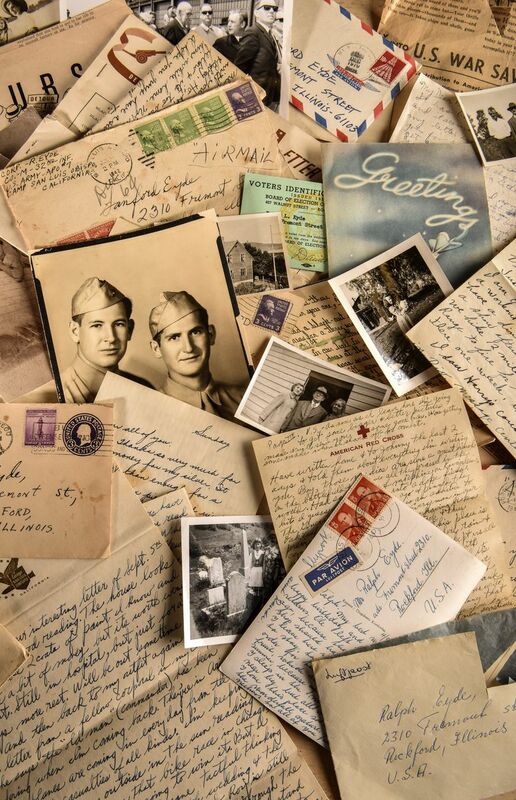 There were hundreds of letters, stretching over four years of war and beyond. They captured the horrors of combat, offered warm reminiscences of childhood and exchanges about everything from the movie “Casablanca” to the brothers’ beloved Chicago Cubs. The brothers also used racist and pejorative language, including in their descriptions of Japanese and German forces. Back at his kitchen table, Alosi, joined by his wife and children, continued to pore over the correspondence. They took turns reading the letters aloud. Alosi wondered how such an intimate and gripping collection had ended up in a storage locker, whether any of the brothers had children, and if there was anyone left who would care to see them. What remained was the story contained in the letters. “We have been called out on air raid alarms the last few days, but you know as much about what was happening as I do, the radio is the only dope we get as well as you about them Japs and Nasty Germans. Bastards are what they are, raiding without warnings, sneaking up at night and such wrong methods of a clean fight.” — Frank Eyde, in a letter home, Dec. 10, 1941. Lorentz Eyde and Margaret Larsen separately came to the United States from Norway and married in Rockford in 1908. He was a cabinetmaker, she a homemaker, and they settled in a small three-bedroom home on tree-lined Fremont Street. Frank, the eldest child, graduated from Rockford Central High School in 1933, the same year that Adolf Hitler became German chancellor. Frank had a wide smile and thick, dark hair, and worked as a traveling soap salesman for Procter & Gamble. His three younger brothers called him “The Salesman,” even though the career didn’t stick. Frank enlisted as a Marine in October 1939 at age 26, shortly after Germany invaded Poland. Two years later, Frank’s younger brother, Ralph, quit his factory job at George D. Roper Corp. to enlist as an Army infantryman at age 23. In a stroke of good luck, both brothers were stationed in California — Frank with the 2nd Marine Division’s 2nd Tank Battalion at San Diego’s Camp Elliott, and Ralph with the 32nd Infantry Regiment of the Army’s 7th Infantry Division at Fort Ord, a sprawling installation near Monterey. Conflict in Europe and Asia seemed far away. “All this falseness of war, it’s hooey!” Frank wrote home in November 1941. He had just been to Los Angeles and spotted Hollywood stars Margaret Lindsay, Betty Grable and Claire Trevor. “Could have dated your choice if I had the dough, say me,” he boasted. On Dec. 7, 1941, the Japanese struck Pearl Harbor. U.S. troops up and down the California coastline began pulling patrols to watch for enemy bombers, as well as preparing to deploy to the Pacific. An attack on the mainland seemed entirely possible. Frank described the changes in San Diego. In Rockford, the other two brothers — Sanford, the second oldest, and John — considered what they might do in the military. Sanford, 26 when the war began, worked at the Woodward Governor factory as a carpenter, and received a deferment. Ralph urged John, 21, who ran a lathe at Roper Corp., making aircraft parts for the military, to enlist but avoid a job in the combat arms. “What I saw I will never forget. I was on a guncrew that shot down a Jap bomber coming right at us about 20 feet off the water and about 25 feet from our boat. In all, our ship shot down five bombers coming right close to the ship, trying to crash into it.” — Frank Eyde, in a letter home in summer 1942. Frank became a section chief for an intelligence unit in 2nd Tank Battalion, overseeing 18 men. He told his father in a letter home in May 1942 that he had learned how to do everything from changing the treads on a tank to using a 37mm antitank gun that was pulled by a Jeep. “Wherever I am, I know how to take care of myself and you know my speed, so watch them babies fall when I get that gun working, rolling at speeds over the sands,” Frank wrote. Frank’s unit sailed to the Solomon Islands. U.S. commanders launched a multipronged attack there on Aug. 7, 1942, placing Marines and sailors ashore under fire on the islands of Tulagi, Gavutu, Tanambogo and Guadalcanal. Frank’s unit was deployed to Tulagi, where hundreds of Japanese soldiers fought to the death on a strip of land about three miles long and a half-mile wide. Frank’s unit withdrew from Tulagi relatively quickly, moving to the New Hebrides, a group of tropical islands off the east coast of Australia now known as Vanuatu. In February 1943 Frank contracted malaria and jaundice, and the Marines sent him home from the South Pacific. “As long as you know now that it was only a slight head wound + nothing more it’s okay by me. It was plenty close but I was never out of the 18 straight days of action nor in any hospital or rest camp. Too many fellows worse off than myself at the time so I had it dressed the following day while eating my field ration (was hit the same day I landed — shell landing 15 feet away while pushing ahead). But all this a thousand times over never held up this outfit.” — Ralph Eyde, in a letter written home Sept. 28, 1943. It was possible, Ralph wrote, that the division would be sent to “Japan itself,” underlining the two words for emphasis. In April 1943, Ralph left San Francisco on a transport ship, traveling under the Golden Gate Bridge, and then heading north to Alaska. Japanese soldiers had landed unopposed in the Aleutian Islands in June 1942, taking control of the islands of Kiska and Attu and raising fears that they could use them to launch attacks on the continental United States. The invasion was the first on an American territory since the War of 1812. The Battle of Attu began May 11, 1943, with Ralph’s unit landing on muddy shores as part of Operation Landcrab. Over the next three weeks, in frosty, miserable conditions, 15,000 American and Canadian troops battled about 2,300 well-fortified Japanese soldiers. All but about 30 Japanese soldiers fought to the death. Ralph suffered a head wound from a shell early in the battle but shrugged it off and stayed in the fight. Frostbite and other exposure injuries were common, and the battle did not conclude until the remaining Japanese fighters made a “banzai” charge through American lines that resulted in furious hand-to-hand combat. U.S. accounts of the battle state that 549 Allied troops were killed, 1,148 more were wounded and, 1,814 suffered through cold-weather injuries and disease. “I am still here at the U.S. Naval Hospital being watched over by some experts in the art of bringing one back to normal.” — Frank Eyde, in a letter to his mother from a hospital, July 11, 1943. While Ralph remained on Attu, Frank returned to San Diego. He initially appeared upbeat, writing his brother Sanford in June 1943 that he had just arrived “from the other side” and was looking forward to a 30-day furlough in Illinois. But Frank had begun a long downward spiral. Traveling back to Rockford, he experienced a paranoid episode on Chicago’s Navy Pier on July 7, 1943, believing people were watching him, according to military documents obtained through the Freedom of Information Act. Authorities found him confused and restless, prompting the military to admit him to the Great Lakes military hospital north of the city for observation rather than allowing him to continue home. “He wishes to return to duty, but does not believe that he is well enough for combat duty at this time,” a hospital report said. Frank continued to struggle. He was transferred in September to a Navy base in Crane, Ind., where he could be closer to home, but was court-martialed in December 1943 after an unauthorized absence from the base. He was demoted from sergeant to corporal, with Marine officials pointedly noting that he had a drinking problem, according to military documents. “When dawn broke and the sun was shining brightly, the dead Japs were piled in lines where our machine guns had been mowing ‘em down all night.” — Ralph Eyde, in a spring 1944 letter to Frank. By January 1944, following jungle-warfare training in Hawaii, Ralph was back on the high seas. U.S. commanders sent his division to assault the Marshall Islands, on which the Japanese had several airfields. Allied forces launched Operation Flintlock on Jan. 31, 1944, with soldiers from the 7th Infantry Division coming ashore on Kwajalein Atoll. The Army caught the Japanese underprepared, but they still fought fiercely. On Feb. 4, Ralph and his comrades found themselves facing Japanese soldiers who screamed wildly as they made a final, furious charge under cover of darkness. The battle continued until after dawn, when Ralph was hit by a Japanese shell and blown 20 feet out of his foxhole, with shrapnel wounds to the lung. Ralph was dizzy from his concussion and wounds, he wrote, but continued to throw hand grenades. Ralph’s machine-gunner lost an eye, but both men survived. Ralph later boasted to Frank that American soldiers would beat “the tricky and cunning Jap” anytime. The Battle of Kwajalein ended with 142 American troops killed, two missing and another 845 wounded. The Japanese lost more than 4,300 men. “Golly, you sure get your share of battle, don’t you?” John wrote Feb. 11, not knowing that Ralph was wounded and being shipped to Hawaii for treatment. By then, John was a member of the Army Air Forces, and training for a deployment to the Pacific with the 505th Bombardment Groupat Wendover Airfield in Utah. “Be a soldier like you use to pitch Ralph, and you’ll be O.K. — and you know I’m always on your side, howling it up for you and thinking about you all the time — so give them Japs hell,” John wrote. 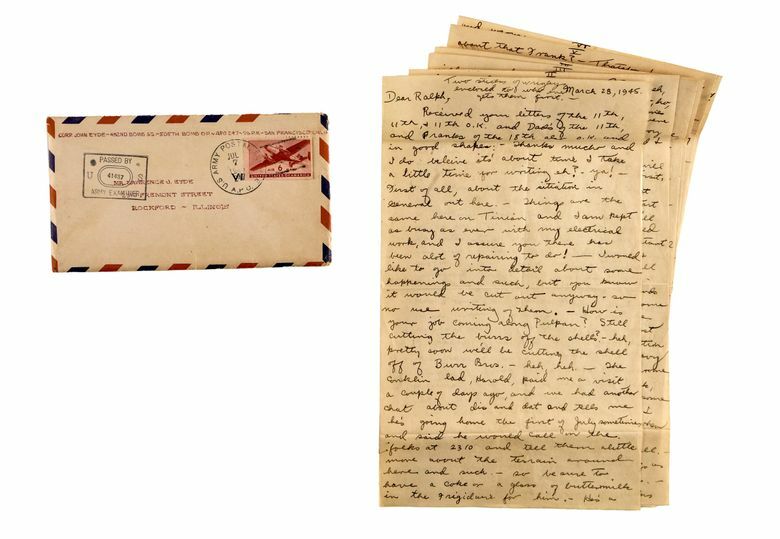 The Eydes learned that Ralph had been “seriously wounded” on Kwajalein in a telegram on Feb. 16, and received a letter from a general confirming the news the following day. Sanford wrote his younger brother immediately. “Japan hasn’t seen 1/100 of blastings she’s going to in the near future.” — John Eyde in a letter home, July 1945. Frank’s situation continued to worsen. He was ordered from his base in Indiana to the naval hospital in Charleston, S.C. where he was diagnosed as schizophrenic. Doctors in Charleston also reported that Frank told them he had several sexual encounters with men while drunk and regretted it afterward. As his mental condition worsened, his letters got shorter and shorter, usually touching only on the weather and baseball. Frank was transferred in April to Bethesda. Doctors there found him “dreamy and preoccupied but in good conduct,” but also said that he “smiles fatuously and inappropriately.” Institutional care, they determined, was still necessary. Frank was transferred to St. Elizabeths Hospital, a psychiatric hospital in Southeast Washington. Sanford, meanwhile, was rejected by the military in 1944: Doctors declared him “4F,” meaning he was not suited for the service. Sanford traveled to Washington in June to visit Frank, reporting back to the family in a letter that his brother had gained weight and looked “like his good old self at 190 pounds.” By the end of July, Frank was discharged from military service. John deployed late in the year to an airfield on Tinian, which Allied forces had seized that summer in a weeklong battle. The island, part of the Mariana Islands, was viewed by the United States as a key base from which B-29 Superfortress bombers in John’s unit could wage an aerial assault against Japan. He urged his brothers to savor their status as civilians. John stayed abroad for another eight months, working on the electrical components of airplanes. “The British Lancasters and Lincolns will soon be over and with their 11 ton bombs they should be able to push disaster on any underground factories that may be in Japan,” he wrote in July 1945. The following month, the United States dropped atomic bombs on Hiroshima and Nagasaki in Japan. Within days, the war was over. John had already been thinking about life after the war. He suggested to Ralph that they open a sporting goods store. “Thanks for keeping my whereabouts a secret and that is a good way to describe my movements — “in and out” all the time. Ha, ha.” — Ralph Eyde in a June 1959 letter to Sanford and John. Frank continued to struggle for many years after the war, unable to hold a steady job. In March 1954, John wrote to Ralph that “Frankie boy” was recently freed after serving 20 days in jail. But he outlived John and Sanford and died in 1996, aged 83. John, who opened a window installation business out of his childhood home after the war, fell ill in 1962, dying from a brain tumor at a Veterans Affairs hospital in Madison, Wis. Sanford, who continued to work at Woodward Governor, died in 1971 at age 56. Ralph’s life took more unusual turns. He briefly stayed home in Rockford, but then took a job with the U.S. Atomic Energy Commission, witnessing the testing of nuclear bombs in South Pacific in the 1950s. Ralph was assigned to perform work on a Navy construction contract in Saigon in 1967, according to a copy of his travel orders obtained by The Washington Post. He wrote letters through at least 1970, as the Vietnam War raged around him. But he did not describe his work. Ralph’s family suspected that he was in the CIA. When he died in 2003, aged 85, his obituary said he had served in the agency. The CIA, asked whether Ralph served either as an officer or as a contractor, declined to comment. For eight years, Alosi sat on the letters he had found in a storage unit, unable to find relatives, before contacting The Washington Post, which located distant relatives. The closest surviving family member is Vicki Venhuizen, a second cousin of the Eyde brothers who said she remembers them as young men. None of the brothers married or had children, she said, and many of the other cousins who were close to Ralph have died. Venhuizen, of Mesa, Ariz., said that in Ralph’s later years, he settled in Rockford and collected the family correspondence, which he stored in plastic bins, along with a collection of vinyl records. A now-deceased cousin of Venhuizen’s, Darwin Backer, grew close to Ralph and listened to many of his stories, she said. Backer took care of Ralph’s affairs when he died, including his obituary. He turned over the letters to Vicki’s half sister, Judith Jones Ellis, who served as an unofficial family historian. 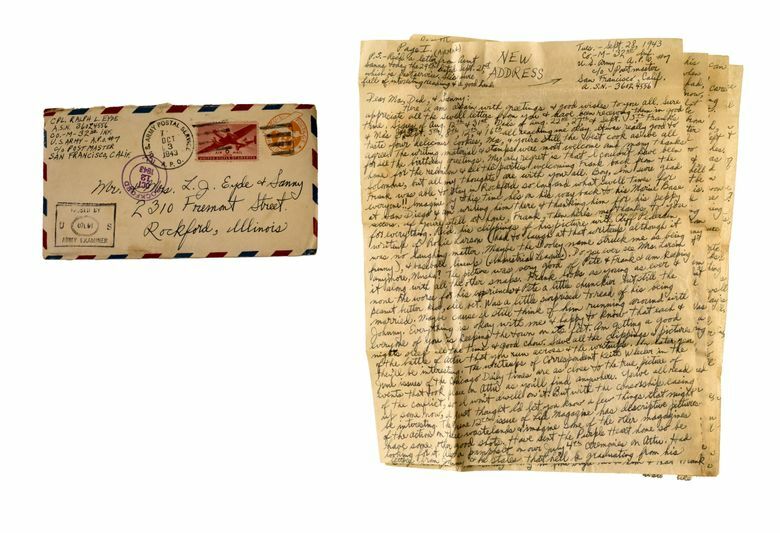 Ellis took the letters back with her to Arizona, where she also lived, Venhuizen said. Ellis died a few years later, and it’s likely that family members in Arizona did not realize the significance of the letters or what they detailed, she said. Somehow, they ended up in the storage unit. Venhuizen expressed gratitude to Alosi for not throwing them away. She considers the Eyde brothers her heroes, but believes the letters are Alosi’s now. Alosi said he’s still uncertain what to do with the letters. The Washington Post’s Julie Vitkovskaya, Carol Alderman and Bridget Reed Morawski contributed to this report.